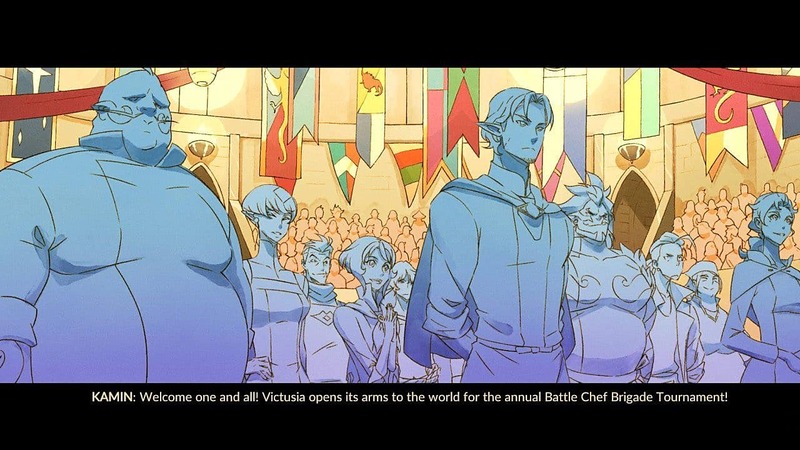 Battle Chef Brigade is a game that I have been following for years now. Ever since it first showed up playable at PAX three years ago, it has been casually sitting on the back burner in my head as one of the games I was looking forward to the most. Since my early days of trying out items as ingredients in Paper Mario and serving grilled orange and hamburger mush to Minnie in My Disney Kitchen, I've yearned for just this kind of experimental fantasy cooking game. 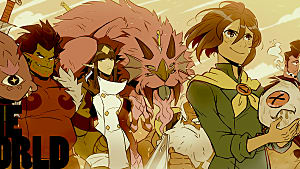 Well, that wait is finally over, as Battle Chef Brigade has finally been released on both PC and Nintendo Switch as of last week. 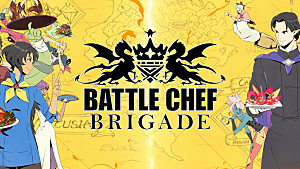 Battle Chef Brigade is the kind of cooking game I've always really wanted but wasn't sure I'd ever get. It's a game where cooking is central and has rules, but it encourages creativity and changing things up rather than forcing the player to stick to a strictly laid-out recipe. 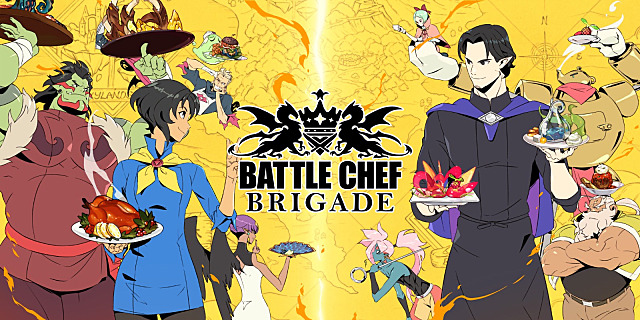 But is Battle Chef Brigade as good as I hoped it would be? Have the four years that Trinket Studios spent on this title shown in the final product? Do we finally have that fantasy cooking game that people like me have always wanted? Let's take it out of the oven and see if it's done. Battle Chef Brigade has a bit of a slow start. Nothing too major, but it takes a little while for the mechanics, characters, and setting to be established before you get to your first real Brigade Tournament cook-off. 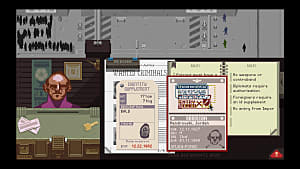 But after that, the story and gameplay move along at an equally competent pace, intermittently spicing things up with new twists and turns as well as new gameplay mechanics and a steadily increasing challenge, which I found to be very enjoyable. What this game really nails -- and it better have -- is the cooking. Trinket Studios has successfully combined action-RPG combat and customization with match-three puzzle games and pulled it off wonderfully. The cooking was something I found to be fun and engaging the entire time I was playing. 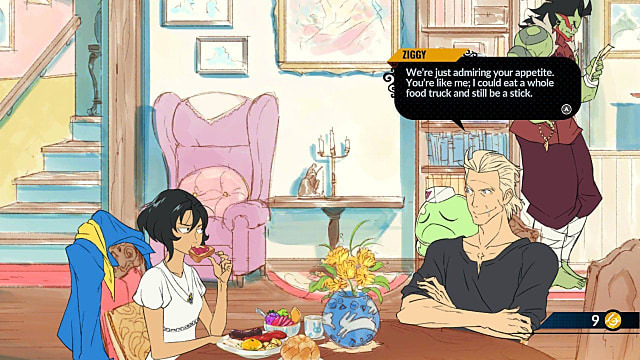 Trinket Studios set out to make a cooking game where the player is given more freedom to experiment and get creative than in other conventional cooking games, and they really succeeded. There are dozens of different ingredients to be collected from your fallen foes, and they can all be mixed together into dozens and dozens of different, delicious-looking foods. You purchase and equip your own selection of cookware and trinkets to customize your play style, drop yourself into the match of the day, and have to please the judges using your combat and puzzling skills. First you receive the theme ingredient from the head judge, learn the flavor preferences of the judges (don't worry, there's only three flavors), and go out into the field to reap your harvest. Then, while under the same time limit, you must play a match-three color-coordinated puzzle game in order to strengthen your dish and defeat your opponent. There are a lot of different tasks you have to manage at once, but the more you stay on top of things, the tastier the reward! The combat feels simple to understand and satisfying, the time limit is just enough to make you feel like you're in a hurry but not too rushed, and over time, you really become familiar with the layout and unique mechanics associated with each arena. There are only three arenas, and towards the end of the game you can tell they're really squeezing all they can out of them, but at least that means they're not under-utilized or poorly thought out. The various equipable items you garner throughout the course of the story slowly build you a bigger and bigger arsenal of cooking tools to work with, and many of them you receive by defeating certain chefs, some of whom can be taken on in different orders or missed entirely on certain playthroughs. 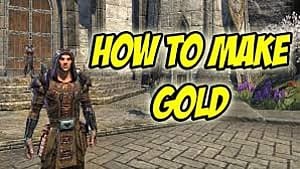 This adds a great deal of strategy as well as replayability to the game as a whole, as there's always another way to approach pretty much any situation. The gameplay is tons of fun -- engaging without being too challenging -- and it's backed up by strong presentation. 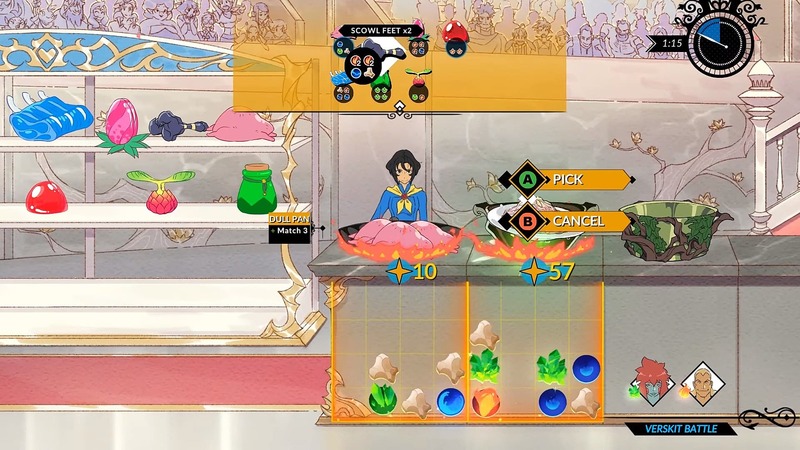 Unfortunately, the presentation and story structure of Battle Chef Brigade are where a few cracks start to show, even if they aren't deal breakers. 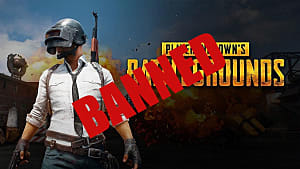 Honestly, most of my issues with this game are pretty minor, all things considered, but I still feel like they brought down my overall experience somewhat. Very few of my complaints have to do with the actual gameplay but rather with how the game was presented and laid out. The first thing that bothered me -- oddly enough -- had to do with the game's graphics. Don't get me wrong, this game looks wonderful most of the time, with its lovingly drawn backgrounds, beautiful color choices, and top-tier character and monster design. 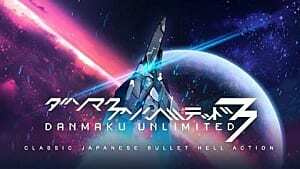 The people at Trinket Studios were inspired by the games of Vanillaware, namely Odin Sphere, and it's not just the gameplay that reflects that. The art design is extremely stylized, detailed, warm, and just pleasant to soak in; it gives me vibes of a Winnie the Pooh cartoon co-animated by the crews of Kill La Kill and Steven Universe. At times when the various design elements of the game's art style come together, the results are stunning. But all of these quality elements still didn't distract me from the animation. I'm not saying the game is poorly or lazily animated -- it's just not all that animated period. The game is surprisingly still at times, with most frames in dialogue-heavy cutscenes looking like screenshots, barring the occasional flickering torch in the background or falling rose petals layered over the screen. Without trying all that hard, I was able to count the number of frames of animation that most characters had when in motion, and some characters never even move at all. The dialogue in cutscenes being carried out with still-frame, visual novel-style conversations is fine, as there are many different and very expressive frames, and most of the voice acting is very solid and impressively natural sounding. But even in that case, some characters just flat out never move. More than one frequently appearing and plot-important character literally never budged at all, only ever speaking in one locked position without exception, which after not-too-long became very distracting. I'd like to reiterate that these animation elements by no means make the game unappealing to look at, as the graphics are still very pretty, and I'm sure the devs worked hard on them. But the lack of movement often keeps the game from fully coming to life. Even just a few more details, like blades of grass blowing in the wind, and a a few more frames here and there would have made a big difference in the game's overall look and feel. Take this cutscene for example. Every blue character is important and has a name. Wouldn't it make sense to color them in to make them pop out more? My second issue is with the writing and story. Again, it's not bad, really. In fact, it's usually quite good, with some plot surprises, distinct and likable characters, and solid world building to back it all up. But again, I'd love to have more of it. I feel as though the character stories that we were exposed to here have only given us a glimpse of the scale and story of the world in which this all takes place, and I don't feel like I got enough of a chance to really get to know a lot of the really interesting characters in the cast. I suppose my biggest overall problem with Battle Chef Brigade is that in certain regards, I just don't think there's enough of it. The game isn't short by any means -- clocking in at around 13 or so hours for me, not including the time I spent on the challenges and daily cook-offs -- but for how solid the core gameplay is and how interesting the world is, I think there's a lot more that could be done. That same sentiment can apply to my comments on the writing and animation as well; I'd just like more please. More areas to fully utilize the very fun and thought-out mechanics, more animation to make the world feel alive and show off the quality of the art, and more story so I can spend more time with the great characters and learn more about the interesting world they've created. Thankfully, Trinket Studios seems to be planning to expand the game in the future by adding in new playable characters with their own campaigns. 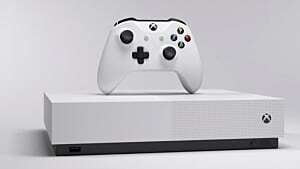 At time of writing, I am unsure if these will be paid DLC or free content updates, how long they may take to make, or how many they may have planned (though if the Kickstarter goals are to be trusted, we've been promised at least two), but I am happy to hear it and excited regardless. To be fair, most of my concerns can be fixed with future updates, and the core of the game is still solid and pretty well-presented despite its flaws. 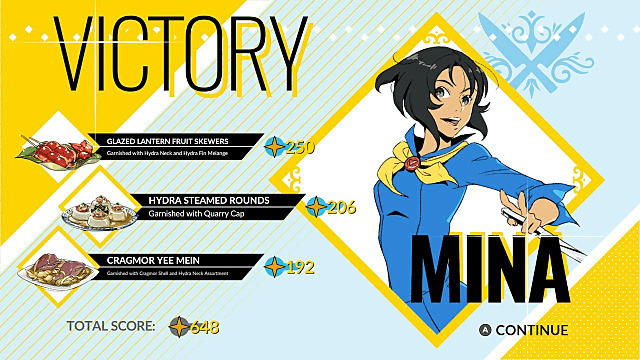 I would be lying if I said I wasn't having fun the whole time that I was playing Battle Chef Brigade. I may have spent a lot of time discussing its issues, but there's still a lot to like. It's fun, very technically balanced, creative, charming, and pretty. It's probably one of the most original games I've ever played, which gives it the benefit of no competition in its field. To quote Yahtzee Croshaw: "Despite its flaws, get it anyway, because you will never experience anything else like it." It's a flawed game, and its general scale may be smaller than some people hoped for, but it nonetheless delivers on its intentions of creating a fun and unique cooking game that encourages creativity. 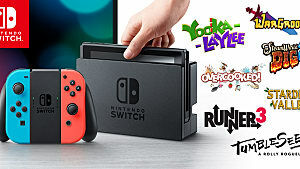 It's a game that I can absolutely recommend to anybody who wants something fun or truly unique, and it's a great game for short portable sessions on the Switch. At $20, it's a feast of an experience at a value meal price. Unique, well executed, creative, and full of charm and fun, Battle Chef Brigade is a wonderful dish made with love.